Cladogram based on the molecular analysis by Andersen and colleagues published in 2017. Dacelo and Actenoides are paraphyletic. The shovel-billed kookaburra in the monotypic genus Clytoceyx sits within Dacelo; the glittering kingfisher in the monotypic genus Caridonax is within Actenoides. The tree kingfishers or wood kingfishers, subfamily Halcyoninae, are the most numerous of the three subfamilies of birds in the kingfisher family, with around 70 species divided into 12 genera, including several species of kookaburras. The subfamily appears to have arisen in Indochina and Maritime Southeast Asia and then spread to many areas around the world. Tree kingfishers are widespread through Asia and Australasia, but also appear in Africa and the islands of the Pacific and Indian Oceans, using a range of habitats from tropical rainforest to open woodlands. The tree kingfishers are short-tailed, large-headed, compact birds with long, pointed bills. Like other Coraciiformes, they are brightly coloured. Most are monogamous and territorial, nesting in holes in trees or termite nests. Both parents incubate the eggs and feed the chicks. Although some tree kingfishers frequent wetlands, none are specialist fish-eaters. Most species dive onto prey from a perch, mainly taking slow-moving invertebrates or small vertebrates. 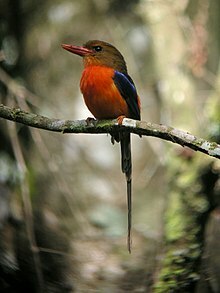 The tree kingfisher subfamily is often given the name Daceloninae introduce by Charles Lucien Bonaparte in 1841, but the name Halcyoninae introduced by Nicholas Aylward Vigors in 1825 is earlier and has priority. The subfamily Halcyoninae is one of three subfamilies in the kingfisher family Alcedinidae. The other two are Alcedininae and Cerylinae. The subfamily contains around 70 species divided into 12 genera. A molecular study published in 2017 found that the genera Dacelo and Actenoides as currently defined are paraphyletic. The shovel-billed kookaburra in the monotypic genus Clytoceyx sits within Dacelo and the glittering kingfisher in the monotypic genus Caridonax lies within Actenoides. Kingfishers are short-tailed, large-headed, compact birds with long, pointed bills. Like other Coraciiformes, they are brightly coloured. The tree kingfishers are medium to large species, mostly typical kingfishers in appearance, although shovel-billed kookaburra has a huge conical bill, and the Tanysiptera paradise kingfishers have long tail streamers. Some species, notably the kookaburras, show sexual dimorphism. Most tree kingfishers are found in the warm climates of Africa, southern and southeast Asia, and Australasia. No members of this family are found in the Americas. The origin of the family is thought to have been in tropical Australasia, which still has the most species. Tree kingfishers use a range of habitats from tropical rainforest to open woodlands and thornbush country. Many are not closely tied to water, and can be found in arid areas of Australia and Africa. Tree kingfishers are monogamous and territorial, although some species, including three kookaburras, have a cooperative breeding system involving young from earlier broods. The nest is a tree hole, either natural, and old woodpecker nest, or excavated in soft or rotting wood by the kingfishers. Several species dig holes in termite nests. No nest material is added, although litter may build up over the years. Both parents incubate the eggs and feed the chicks. Egg laying is staggered at one-day intervals so that if food is short, only the older, larger nestlings get fed. The chicks are naked, blind, and helpless when they hatch, and stand on their heels, unlike adults. Although some tree kingfishers, such as the black-capped kingfisher, frequent wetlands, none are specialist fishers. Most species are watch-and-wait hunters which dive onto prey from a perch, mainly taking slow-moving invertebrates or small vertebrates. 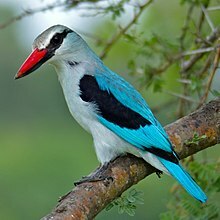 The shovel-billed kookaburra digs through leaf litter for worms and other prey, and the Vanuatu kingfisher feeds exclusively on insects and spiders. Several other western Pacific species are also mainly insectivorous and flycatch for prey. As with the other kingfisher families, insectivorous species tend to have flattened, red bills to assist in the capture of insects. ^ a b Andersen, M.J.; McCullough, J.M. ; Mauck III, W.M. ; Smith, B.T. ; Moyle, R.G. (2017). "A phylogeny of kingfishers reveals an Indomalayan origin and elevated rates of diversification on oceanic islands". Journal of Biogeography: 1–13. doi:10.1111/jbi.13139. ^ Bock, Walter J. (1994). History and Nomenclature of Avian Family-Group Names. Bulletin of the American Museum of Natural History. Number 222. New York: American Museum of Natural History. p. 118. ^ Fry, Fry & Harris 1992, pp. 6-11. ^ Fry, Fry & Harris 1992, pp. 21-22. ^ a b Fry, Fry & Harris 1992, pp. 12-13. ^ Fry, Fry & Harris 1992, pp. 17-18. Wikimedia Commons has media related to Halcyoninae.